KHÁNH HÒA – People in central coastal Khánh Hòa Province’s Nha Trang City are protesting against a solid waste treatment system in the provincial General Hospital after it was launched recently, the Voice of Việt Nam (VOV) has reported. More than 60 households located near the hospital have sent a petition to the city authorities complaining that the location of the system would affect the environment there, according to the VOV. Most of them disagreed with the hospital’s construction, when they attended recent talks with the investors, such as the hospital and the provincial health department. Local residents opposed the plan because the hospital is located in the centre of the city that has a high population density, offices and tourist crowds. They also protested that the investors did not publish anything about the project and also the environment impact assessment. Nguyễn Văn Đồng, a local resident, said the hospital was built without leaving any space between it and other buildings, and so it would seriously affect the environment. Medical waste from the hospital and other facilities earlier was transported to the Dermatology Hospital for treatment. But four or five years ago, this waste furnace stopped working, causing difficulties in waste treatment. 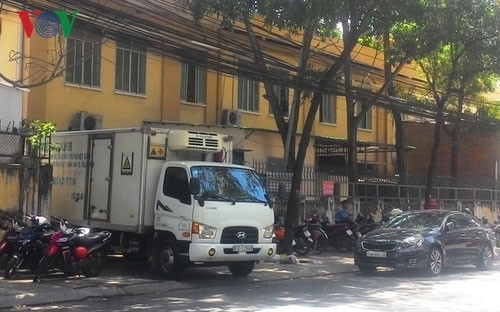 The general hospital had to rent a unit to transport 250kg of solid waste each day to Bình Dương Province for treatment at a cost of VNĐ200 million (US$8,960) a month. To deal with the problem, Health Ministry permitted the hospital to build a treatment system that can handle 500kg of medical waste per day within its premises. Mai Văn Thắng, Deputy Director of the provincial Natural Resources and Environment, said it would take waste samples for periodic monitoring and would shut down the system if its treatment process was found to be of poor quality. The modern technique would not affect the environment, Bùi Xuân Minh of the provincial health department said.